Named the Texas Auto Writers Association’s “Compact Sport Utility Vehicle of Texas,” the 2017 Jeep Cherokee pays homage to a rich history of the original sport utility vehicle with truly impressive features and capabilities. We want to make sure you know everything there is to know about the Jeep Cherokee, so our experts have highlighted the features and compiled them on to one comprehensive research page for you to peruse. Read on to learn about the performance, interior, and safety features you can expect from the Jeep Cherokee. Do you have any questions for our team of automotive specialists? If so, you can contact us by calling (888) 280-6103, and we’ll be happily provide answers. There are two engine options available when you choose the incredibly capable 2017 Jeep Cherokee, each of which offers impeccable torque and horsepower. Whether you choose the 2.4L TigerShark® MultiAir® 2 engine or the 3.2L PentaStar® V6, you are going to love the responsive and smooth ride you’ll experience with the Cherokee. Since both engines provide you with the ability to tow thousands of pounds, the Cherokee is ideal for family vacations with an AVT or trailer. Be sure to pick your favorite engine when researching trim packages! Take a look at the table below for details on each engine’s specifications. Max. Torque 177 lb.-ft. 239 lb.-ft.
Max. Towing Capacity 2,000 lbs. 4,500 lbs. Now that you’ve determined that the 2017 Jeep Cherokee is the perfect SUV for your active lifestyle, the next step is to learn about the available trims on our trim package research page. You can also head over to our new vehicle inventory to see all of the impeccable Cherokee models we have available for you to test out. 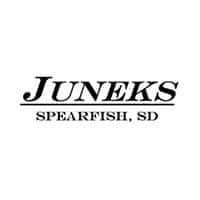 If you have any additional questions about our Jeep dealership in Spearfish, SD, don’t hesitate to contact Juneks Jeep using the form on our website. If you would prefer speaking to one of our team members directly, you can do so any time during our regular business hours by calling (888) 280-6103.